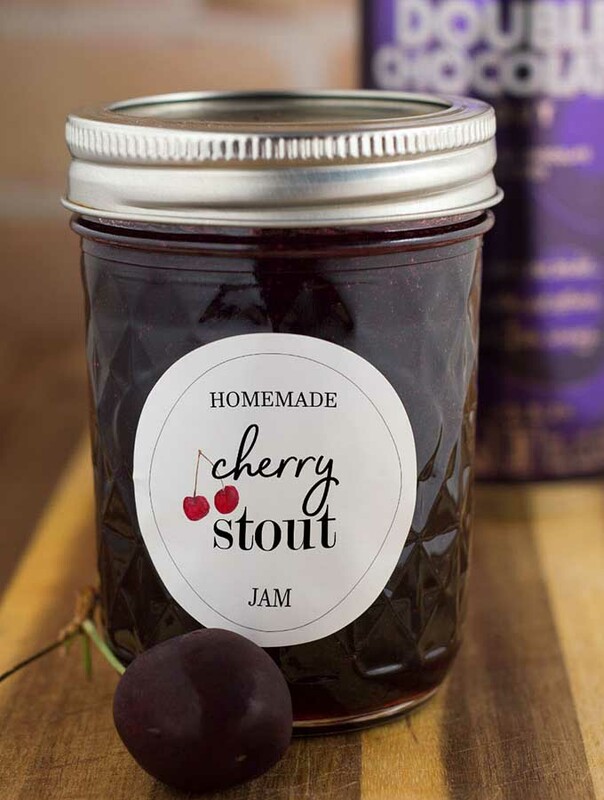 Cherry stout jam combines fresh farmers market cherries and chocolate stout beer for a rich, delicious jam that lets you enjoy a taste of summer all year long! Welcome to Farmers Market Week, in honor of National Farmers Market Week, a time to celebrate the farmers, ranchers and local food producers as well as the communities that make them happen. This blog event is hosted by Christie of A Kitchen Hoor’s Adventures and Cynthia of Feeding Big. Many people (my parents, for example) think I’m crazy to live in Center City Philadelphia. And when I’m driving around for half an hour after work trying to find a parking spot, I wonder for a split second if they are right. But there are many perks to living where I do, too. I don’t need to get in the car to go the coffee shop, the grocery store, my kid’s dentist, my kid’s school, or one of my favorites — the farmer’s market. 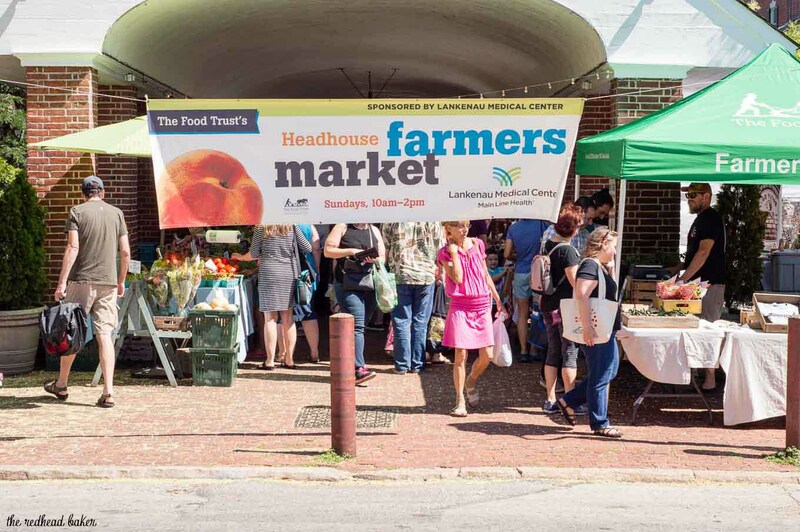 I live a few blocks from one of Philly’s best markets, held at Headhouse Square by The Food Trust. This market has just about everything: fruits, vegetables, herbs, flowers, preserves, honey, cheese, eggs, meat, seafood, bread, coffee, ice cream, even wine! In addition to all of that, I love that the market accepts SNAP and WIC, meaning that lower-income residents can access fresh food. I used to count down the days during winter until the market re-opened. I don’t need to do that anymore, but they announced at the beginning of this season that the market will now stay open year-round! 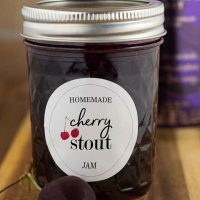 I used cherries I bought at the farmers market to make this delicious Cherry Stout jam. I was originally going to keep a jar for myself and give away the other five. 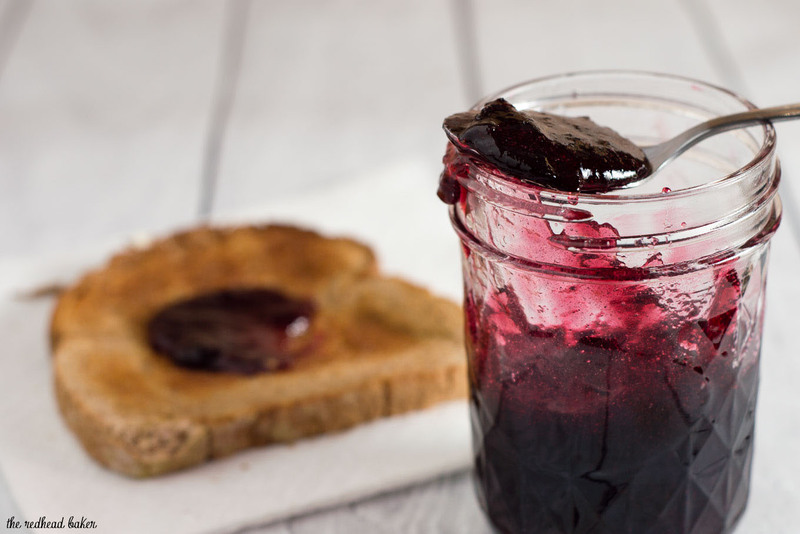 But after tasting this jam, I might keep it all for myself! 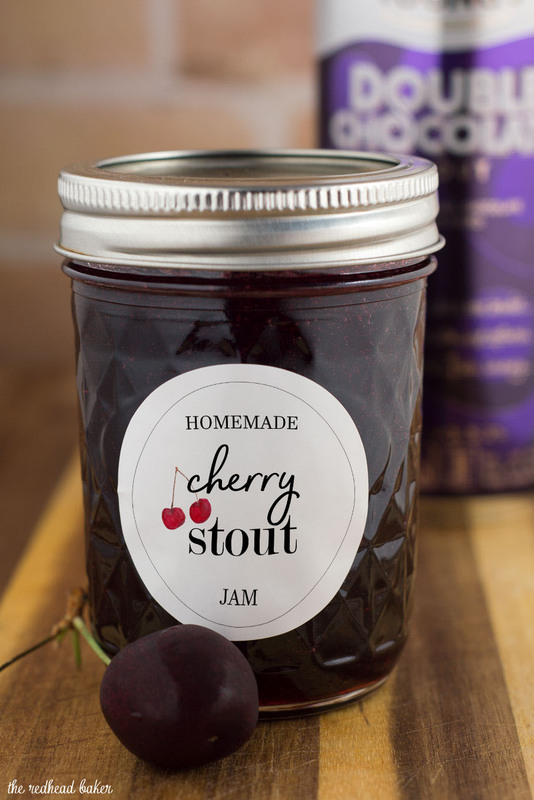 Though there is quite a bit of stout beer in the jam, it’s not a prominent flavor. It just adds to the overall rich flavor of the jam. I used a chocolate stout, but you can use whatever stout you prefer. As with my peach vanilla jam, you can substitute vanilla bean paste for the vanilla bean. Don’t be intimidated by the canning process! It looks like a lot, but it’s much easier to do than it is to describe. 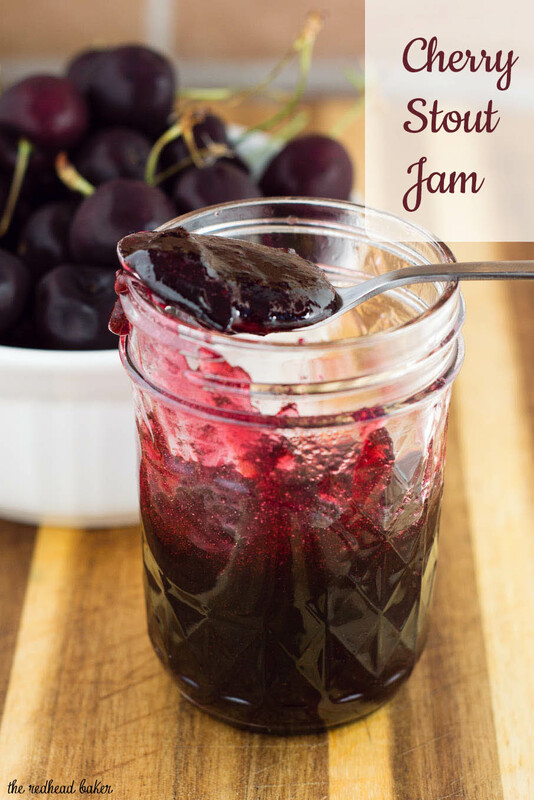 And then you’ll have delicious cherry jam to enjoy all year long. 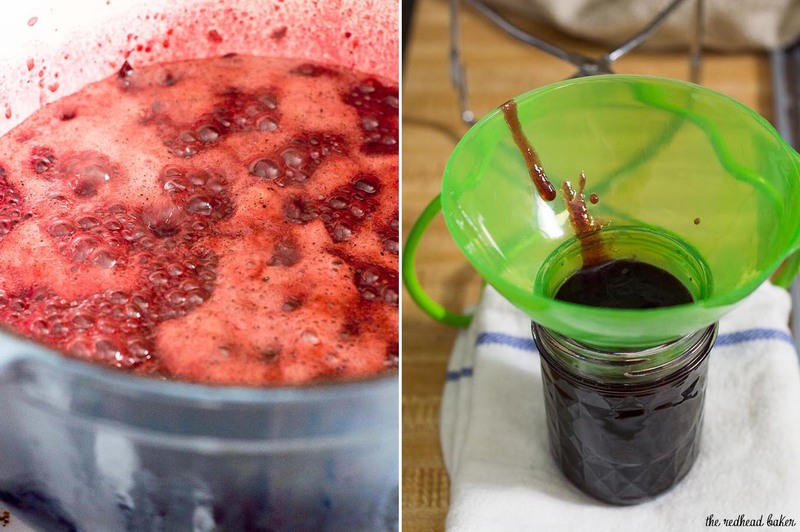 You don't need a special appliance to can preserves. You can use a large pot with a round cooling rack placed on the bottom. You will also need jar lifters, a wide-mouth funnel and a magnetic lid-lifter. Prepare boiling water canner. Heat 6 half-pint jars in simmering water until ready for use. Do not boil. Wash lids in warm soapy water and set bands aside. Combine cherries, stout, and vanilla bean scrapings and pod in an 8-quart non-reactive saucepan (such as enameled cast iron). Gradually stir in Ball® RealFruit™ Pectin. Bring mixture to a full rolling boil that cannot be stirred down, over high heat, stirring constantly. Add entire measure of sugar, stirring to dissolve. Return mixture to a full rolling boil. Boil hard 1 minute, stirring constantly. Remove from heat. Skim foam if necessary. Fish out the vanilla bean pod and discard. Ladle hot jam into hot jars leaving 1/4 inch headspace. Wipe rim. Center lid on jar. Apply band and tighten just until you start to feel resistance. I love making jams and this one sounds like it has such a unique flavor! This looks and sounds absolutely amazing! I would have never thought to pair the two in jam but I love the idea. I wish I could stick my finger through the screen and swipe a taste!